Alright, here is what I have going on. I have a steaming milky cup of Ty-Phoo tea at my desk, listening to John Legend , and feeling so tired (but in a very good way) after a weekend of three birthday parties in the studio. We even hosted a l o v e l y 30th birthday celebration for the most magical woman named Melina who chose a Ukulele lesson party for her friends and family because she had always wanted to learn how to play this sweet little guitar from Hawaii. It was so dreamy and whimsical and a rich, happy time was cherished by everyone who attended. I really love, love, love what I do. The nicest people float through this little studio and it makes me feel so joyful of soul. I have to be careful, you know, it's so sweet in here time just whizzes by. Like now, it's getting dark, the music is loud and delightful - always amazing. I could sleep here happily - It's true! Tonight I am making curry with a gluten free sauce my daughter brought over - and curling up with a good film and a nice glass of wine. Wishing you a splendid week ahead with bright colours and loads of movement and sunshine. A little bit of lovely. (beneath cherry blossoms!) It's been such a magic making week here in the studio. 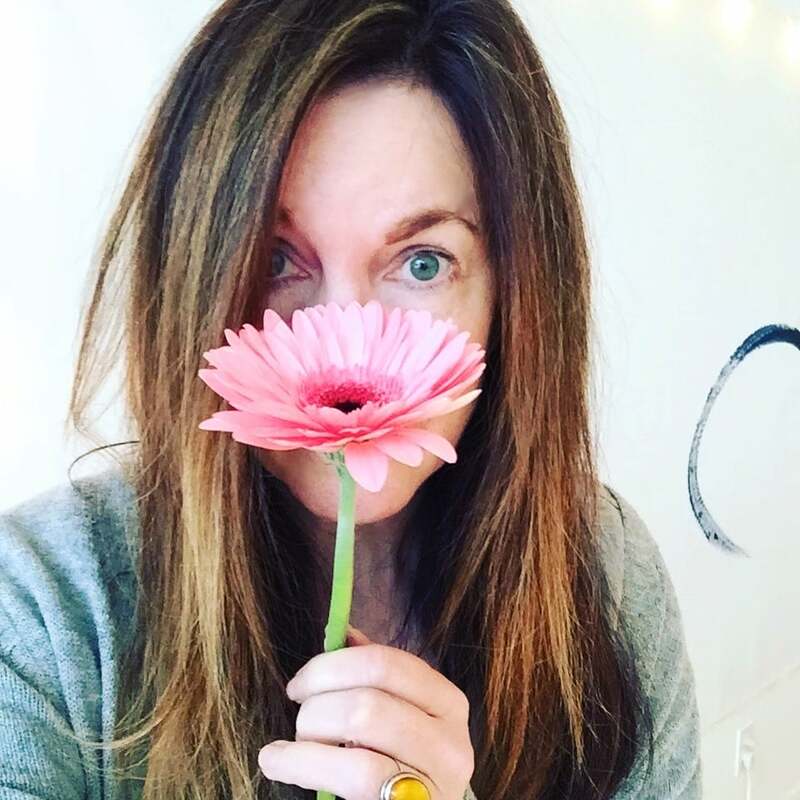 We have been gathering wildflowers in the ChromaKids class (probably because they are best thing ever) and seventeen fabulous women signed up for the "My Sweet Muse' photo e~course." 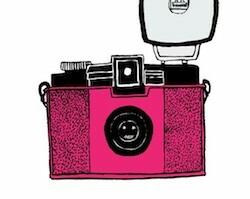 This is a luminous little subscription - 20 days of lovely photography prompts filled with tiny poems, songs, and churchly prayers for beautiful photo's. You will be so inspired to fall in love with photography. I am so happy with this sweet offering and I know you will be too. Here's to tunes a spinning on a Sunday, steamed Almond milk with Maca - and strawberries in a little yellow bowl. There is a blizzard of blossoms outside the studio. It is just so beautiful this flurry of Springtime in my lovely city. The evenings are perfect for taking long walks right now past darling cafe's and fruit stands. The air is filled with the scent of Magnolia and my feet are ecstatic to be out and about in flip flops. I can't stay long (I am painting a tiny canvas inspired by my Blue Sky Acrylic painting class this week) but I had to pop by to share my week with you and in particular seven things that have made me so happy ~ and entirely one zillion percent more wonderFUL and present in the studio. So here they are and I hope they bring you even the teeniest bit of inspiration on this sunshiny day. 1. It's a funny feeling to admit this, I hardly know what to say, but to tell you the truth in the past few months I have become somewhat feral in my appearance. I am in the studio most days by 7:00 a.m and home often around 9~ish and somehow got into the practice of wearing the same things almost every single day so that I might scoot out the door quickly with a smoothie in hand to get to the studio faster. My hair tossed up into a ponytail, paint stained nails, barely a handful of seconds given to morning ablutions, I was looking tired and lackluster as a womanly being to say the least - but I cared not a pin as I was happy as a clam. Sad, but entirely true. I was so 'in the making' so in the creative gust of all things that I did not see that I was completely neglecting my physical being. Well, as the blossoms burst forth on the trees outside my studio windows and I was swooning over all the beauty each morning it eventually occurred to me that it might be time to bring some blossomy beauty to my own being with a healthy dose of self care lovin'. So I booked a pedicure with an extra long sugar scrub and a glorious swoosh of 'Butter' nail polish in Springtime berry, I cycled up to UBC for a few swims and steam room detox sessions, bought myself a pretty dress and loverly fragrance from Diptyque. I embarked on a cleanse to freshen up my eyes with some inner sparkle and even treated myself to a Hammam in the city. It all felt pretty fine I must say. I had no idea that it would make me so happy. I even added a sprinkling of gold highlights to my hair. HALO!! I feel like a million bucks. Well, I always feel like a million bucks (LOVEmyjob!!!) but now I look like a million bucks too. 2. I supercharged my diet - lots of fresh Spring green salads, jazzy smoothies in the mornings (coconut milk, banana, Cacao, blueberries, yoghurt) - wild Salmon at least 3 times a week and lots of water. YUM!! I also made these fab energy bites for the women in my Artist's Journaling class (I call them Bliss balls) and they LOVED them. So will you. I don't make many demands around here but you really ought to try them. Easy Peasy to make too. 3. I found myself the most brilliant, shining, life changing mentor for my business. I can't say enough about Hillary - she is a game changer and so deeply inspiring and smart. And Hillary Samson inspired me to hire a COO to help me take Luminous to the next level. I didn't have far to look as Kerstin already is my dear friend and my brilliant Web designer too. Imagine that! I am so lucky. 4. I collaborated with Vairdy from my Women's Enterprise business group to give, give, give. One of my most favourite things to do in this world for sure. And with Vairdy's talents and my beautiful studio we will offering mini photo sessions May 2 all day long - and all proceeds will go to a cause dear to our hearts "Cause we Care' - to help single mothers and their children with a hand up who are dealing with poverty. I hope you will consider booking one of these sessions - 100 percent of the money raised will go to 'Cause we care.' You can book them here. Trust me, you will LOVE the photo's that this gal takes in your very own mini session. Grab a friend and some props and have silly fun with this session! 5. Inspired by this podcast (YOU MUST LISTEN TO THIS!!!) I reignited my love of spending time with those I love and even closing up the studio to 'smell the sunshine' more often with friends, family and even for solo time alone. I was glad for this podcast - so timely - too much of a great thing is still too much. That's me up there (or my toes rather) blissing out in Lynn Canyon and reading a book. Buttercups, stinkbugs and stars. AMEN. 6. I signed up for a class. In my own studio of course. :) What kind of a loveable self promoter would I be if I didn't mention one of my lovely classes?! Art is AWESOME! But seriously. I am wielding a paintbrush now like a pigment Goddess. I believe everyone should take an art class. You can too. 7. Bought myself some dark chocolate. Of course I added chocolate to this list! Hmmm. I think I have eight things. Dreaming. I am doing a lot lot lot of dreaming. Big ideas blossoming soon in our bright, happy studio. I dream. Sometimes I think that’s the only right thing to do.